So I’m back and mostly unpacked. 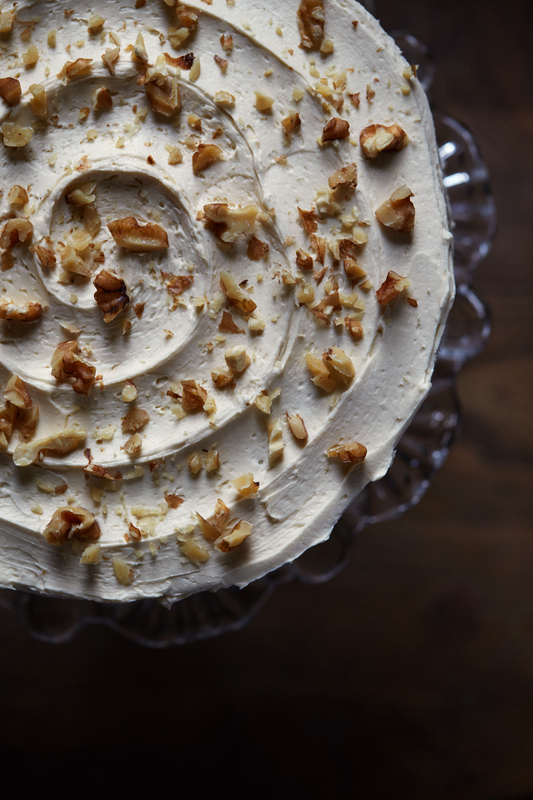 I could say this amazing cake from Roger Saul’s Spelt cookbook is a seasonal cake arrived just in time for the walnut harvest but sadly I wasn’t that thoughtful. 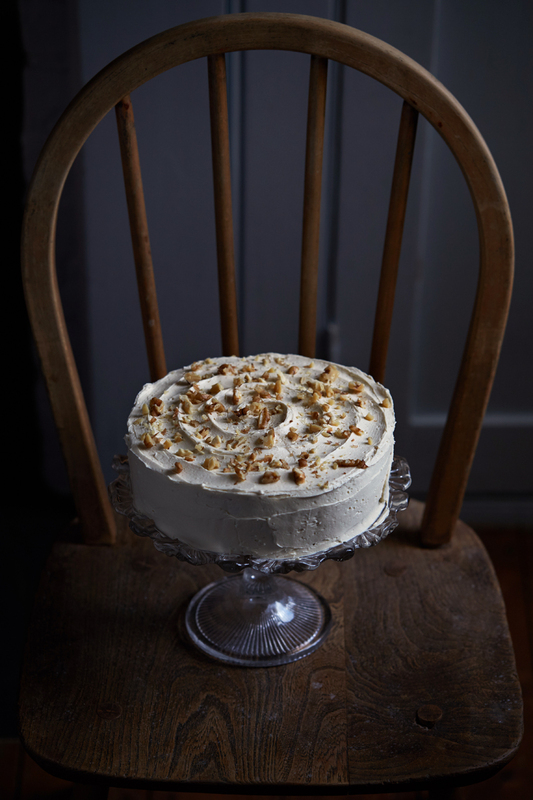 I made and shot this cake a month ago to christen my new kitchen and test out the inherited gas oven. I’m not sure whats worse, a painfully slow gas oven that takes twice as long to cook everything or the left handed sink that forces me to wash up like I’m wearing a straightjacket or so it seems. I don’t know why it’s taken me so long to get this post together but thankfully most of the work was done last week as my newly broken arm is going to hamper the return to cooking, baking and blogging, as well as the last of the unpacking, furniture shabby chic-ing and other DIY projects that are joining a growing list. Those keen eyed amongst you will realise there are only walnuts atop this cake, my newly restocked cupboards didn’t stretch to oats at the time of baking so I had to improvise. I have been assured the streusel topping is worth the effort so will be trying that next time. Preheat the oven to 160°C/315°F/Gas 2-3. Put the walnuts in a roasting tin and roast for 12-14 minutes until they are light brown. Remove from the oven and leave to cool, then tip into a blender, add the oil and blitz to a dry walnut paste. Turn the oven temperature up to 170°C/325°F/Gas 3 and line two 20cm/8in round cake tins and a baking sheet with baking paper. Beat together the butter and sugar in a large bowl, using an electric mixer, until pale and fluffy. Add the syrup, then the eggs, one at a time, followed by the roasted walnut paste. Mix the flour, baking powder and salt in a small bowl, then fold into the mixture. Divide the cake mixture equally between the prepared cake tins. Bake for 30 minutes, or until the top looks golden brown and feels firm to the touch. If in doubt, a skewer inserted in the centre should come out clean. Transfer to a wire rack to cool. While the cakes are cooling, turn the oven up to 180°C/350°F/Gas 4 and scatter the topping ingredients over the prepared baking sheet. Bake for 15 minutes, or until is crisp and golden brown in colour. Remove from the oven and allow to cool before using on the top of the cake. To make the filling and icing, beat the butter in a large bowl, using an electric mixer, until soft, then gradually add the icing sugar and beat until pale and fluffy. Add the vanilla, espresso and salt and whisk again until fluffy. Spread about one-third of the creamed mixture on top of the first sponge cake, then place the second sponge on top. Spread the remaining mix over the top and around the side of the assembled cake and scatter the toasted streusel mixture on top to serve. Thanks Molly. It was! And it kept very well too. Awesome photos too. I really need to invest in a good camera. Thanks so much! I’m learning too as just moved into a new house with new light! That is great! Best luck to you in this new house and keep the good work 😉 I will follow you for sure! Amazing photos and a lovely cake! Hi I am Lynn! wonderful blog you have here! please come and visit me I would love to follow you! lovely blog!